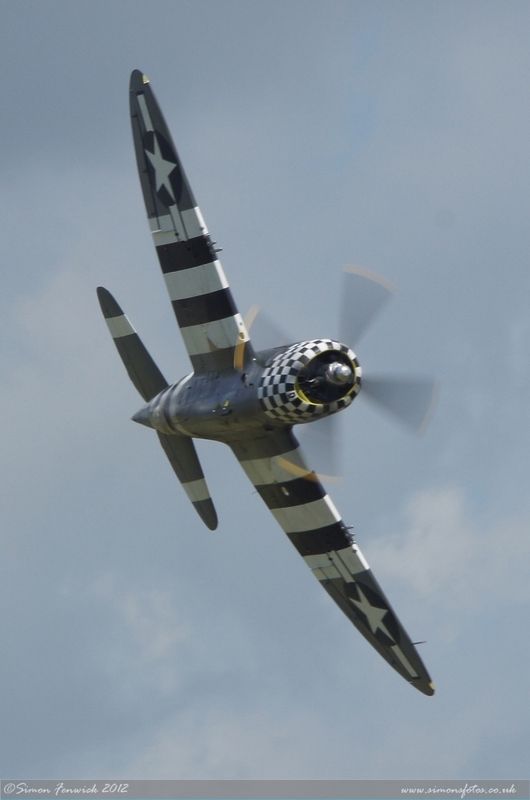 For years now, Flying Legends at Duxford has had a reputation of being arguably the finest piston engine only show in Europe. In these tough financial times, many wondered whether Stephen Grey and his team at The Fighter Collection (TFC) and in association with the Imperial War Museum, could pull together another classic show. But manage it they did. This report is based on the Saturday of the two day show. Following the 2011 show, much discussion went on behind the scenes as to whether changes should be made to how the show actually ran. Changes there certainly were, with the action being not quite so frenetic and (particularly on Saturday) there were gaps between acts which hadn’t happened before, though these may well have been caused due to the high winds that forced the cancellation of a couple of display items. However, this did not spoil the show and in fact gave a bit of breathing time. 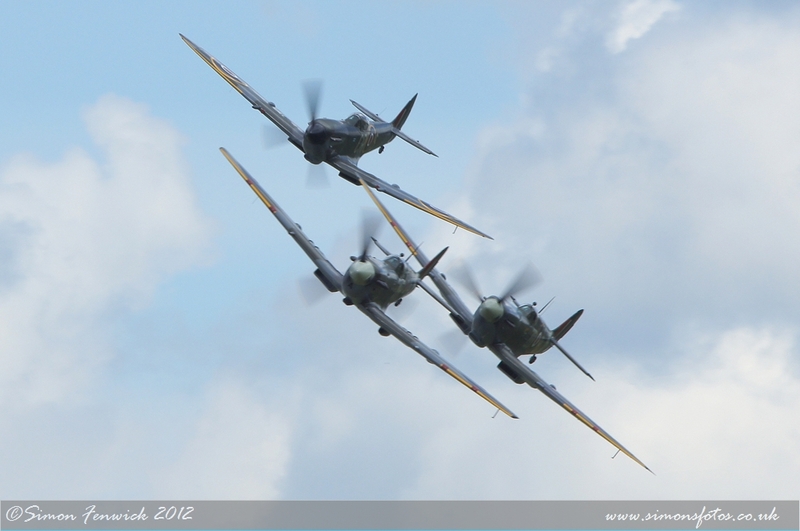 Simon Fenwick/simonsfotos.co.uk reports for Flightline UK. All photography copyright of the Author. Unlike many shows, the participation list is not officially announced until a matter of days before the show. 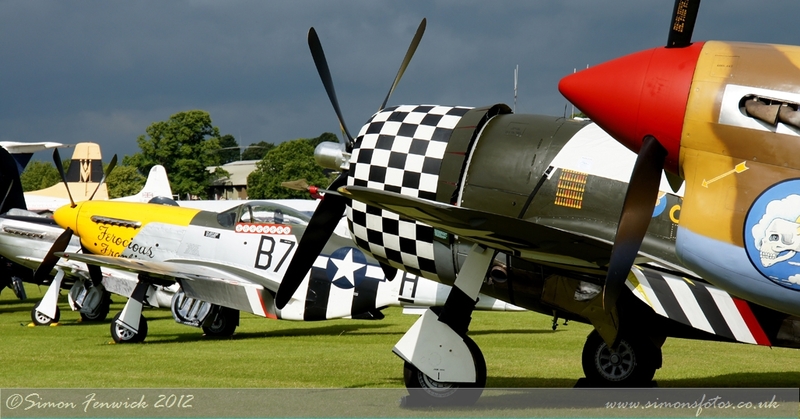 However, this year we did know that there would be the usual mix of warbirds and civilian aircraft – all legends in their own right – and that there would be some that we had seen before and some that were not only new to Flying Legends but also to the display scene in Britain. 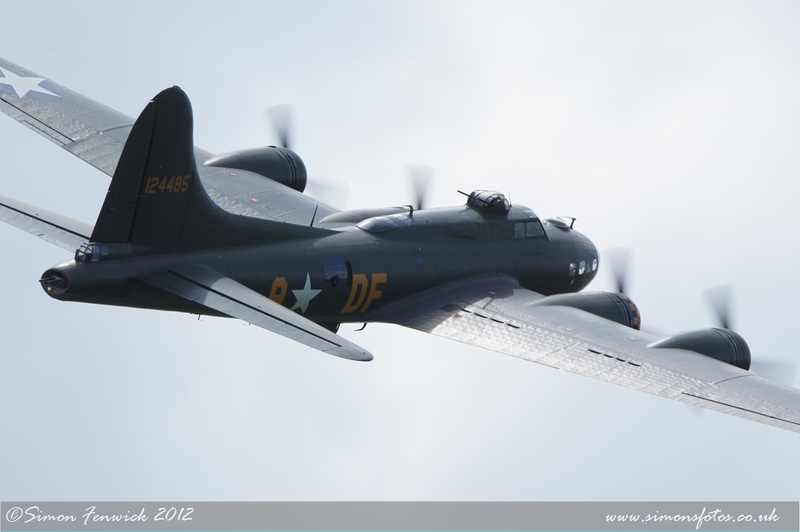 As can be the case with these ‘elderly ladies of the skies’ technical issue can affect what actually turns up and displays and also the weather can have a severe effect – especially in 2012 it seems! 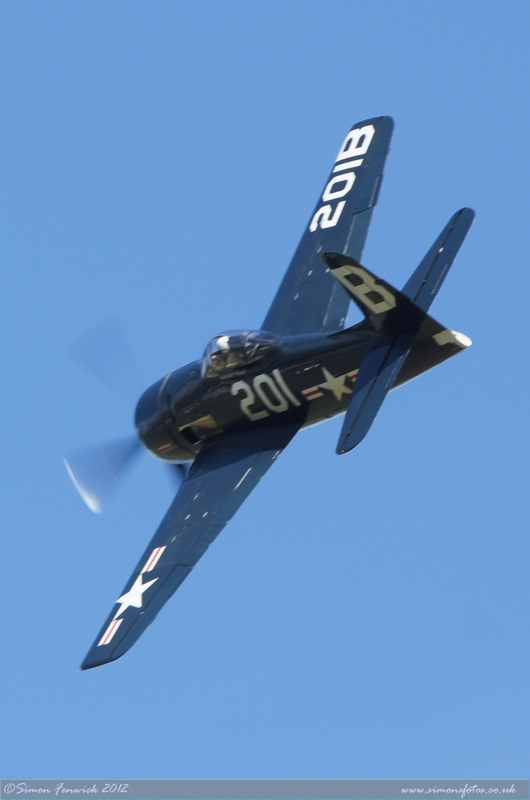 Consequently, the former led to the loss of the Red Bull Corsair and the North Weald based Skyraider – though the latter was present in the static – and TFC’s own Sea Fury T.20. The high winds put paid to displays from the WWI replicas and the Fiesler Storch. The afternoon display started in a slightly different way to usual with a special tribute to warbird pilot extraordinaire, Howard Pardue who was killed recently in the USA whilst flying his Grumman Bearcat. This took the form of something which hadn’t been seen in English skies since the dark days of WW2. 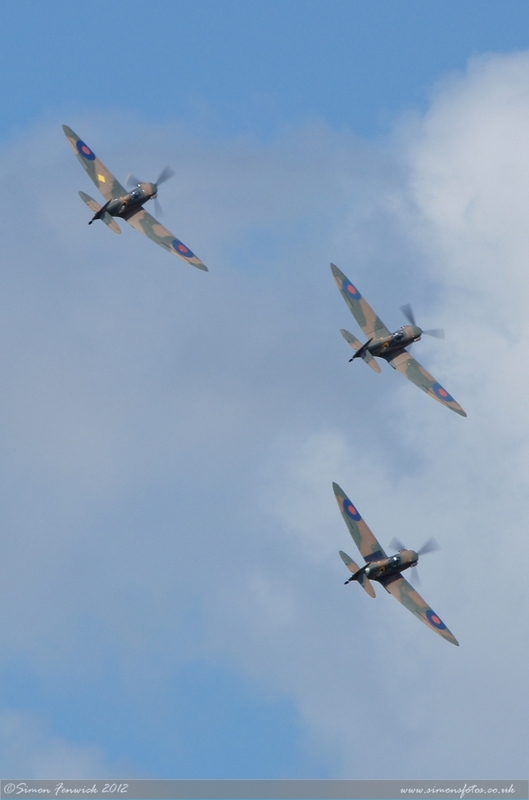 Three Supermarine Spitfire Mk.Is were flown in formation. 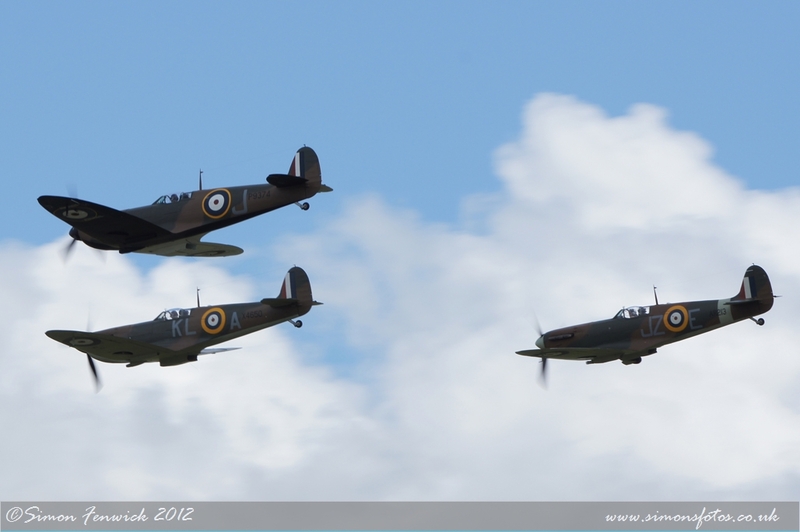 The youngest of these three was Mk.Ia AR213 now owned by Spitfire the One Ltd and flown by Stephen Grey. Delivered to the RAF in March 1941, it never saw frontline service but served with Operational Training Units. Struck off charge in 1944, it was bought by Air Cdre Allen Wheeler for the princely sum of £10! A sum that today wouldn’t get you an aircraft grade bolt! 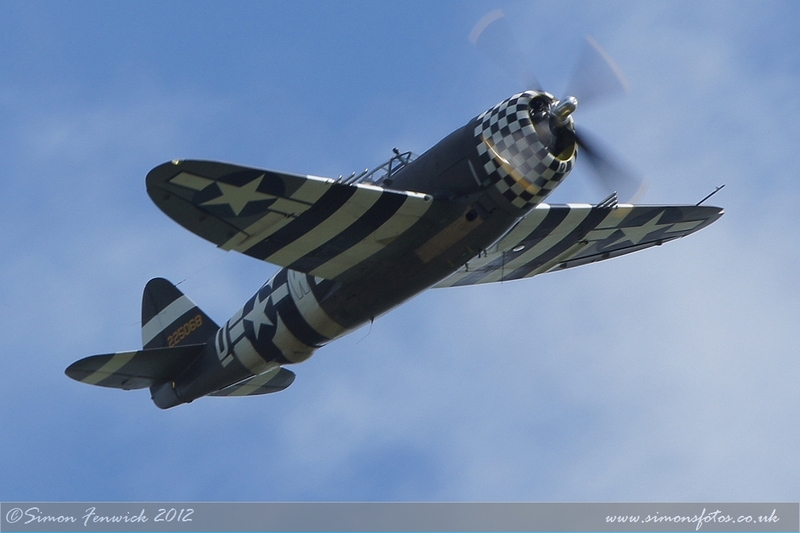 Unfortunately, an undercarriage retraction problem curtailed AR213’s participation in the formation after two passes. Owned by Mark One Partners, Mk.I P9374, is the eldest of the three that took part. Built by Supermarine at Southampton and first flying in February 1940, it was delivered to 92 Sqn at Tangmere and became the regular mount of Plt Off Peter Cazenove. On patrol between Calais and Dunkirk on 24th May, Cazenove was hit by defensive gunfire and although still able to control the aircraft but not get back to British shores, he elected to land it on the beach near Calais. Cazenove spent the rest of the war as a prisoner of the Germans. Meanwhile, P9374 remained where it was, on the beach and relatively undamaged. Over time it was gradually covered by the shifting sand until it disappeared completely. In 1980 a severe storm uncovered the wreckage and it was recovered and placed in storage in France. 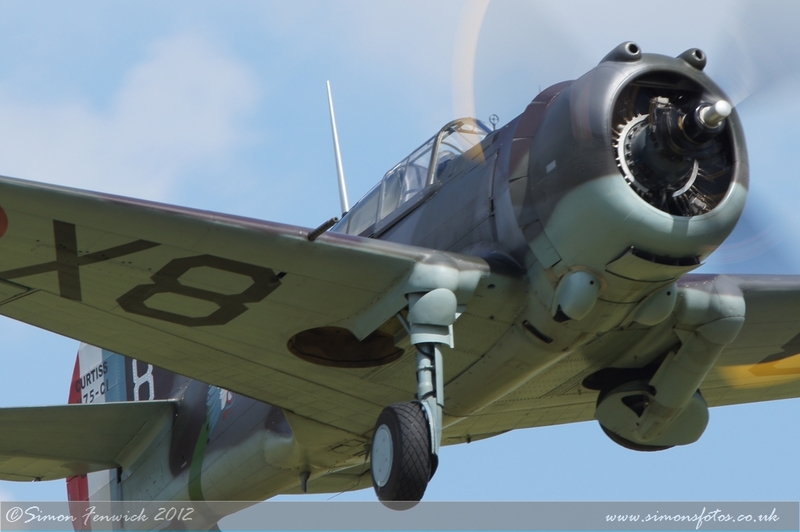 It arrived at Historic Flying at Duxford in 2007 and a full rebuild commenced. 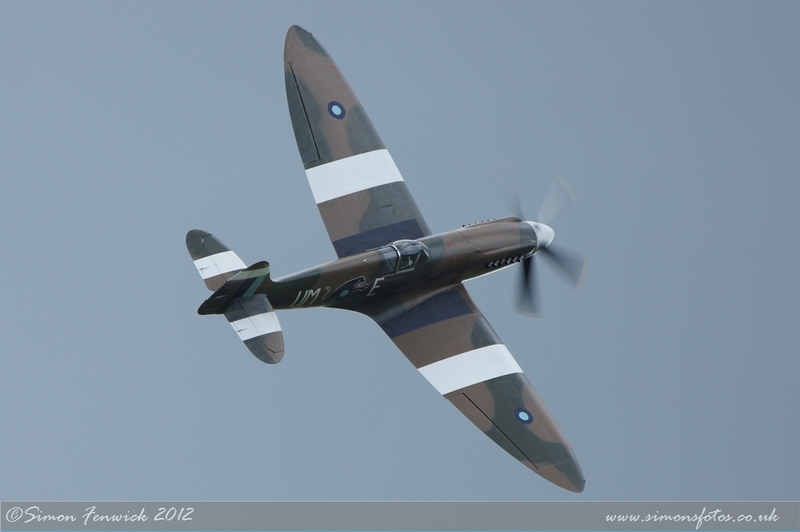 Now resplendent in the early type colour scheme and markings, including the half and half black and white undersides to the wings, P9374 is the only Spitfire flying with the early type three-blade prop and short boss and fabric covered ailerons. 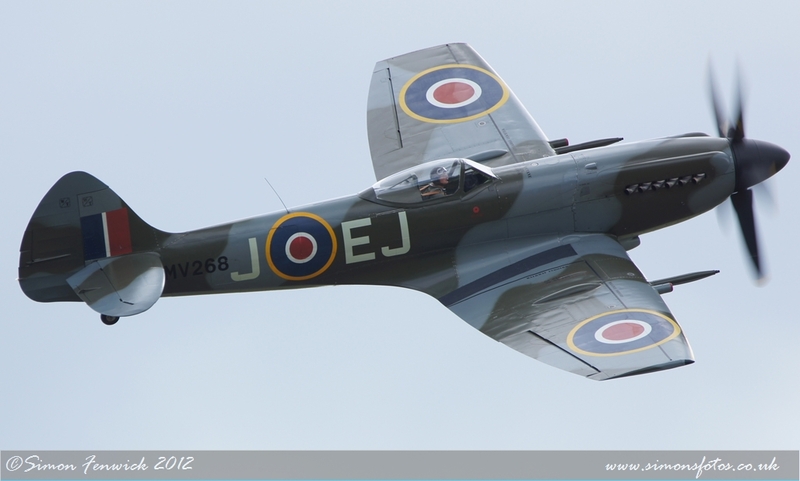 Its first flight after restoration was in September 2011 and Flying Legends 2012 marks its display debut at Duxford. The final Spitfire Mk.I also met a watery grave in WW2. Owned by Dan & Tom Friedkin and painstakingly restored by Peter Monk and his team at Biggin Hill, X4650 was built at Woolston and first flew on 23rd October 1940. Allocated to 54 Sqn at Catterick it was to have a very short service life. Airborne on 28th December, flown by trainee pilot Sgt Howard Squire, along with Flt Lt Al Deere in another Spitfire, the sortie was to involve a practice dogfight. However, Squire managed to collide with Deere during a practice attack. Deere parachuted to safety, landing in a cesspit! His aircraft was wrecked. Squire trimmed his aircraft for a bail-out and jumped also to safety. His aircraft made a controlled belly-landing near the bank of the River Leven. As it wasn’t considered salvageable, the aircraft was pushed into the river where it stayed until 1976. During that long hot summer (unlike that of 2012! ), the water level in the river dropped so much that the aircraft became visible once again and was recovered by local enthusiasts. Peter Monk purchased it in 1990 and began a 15 year search for as many Mk.I parts as possible. 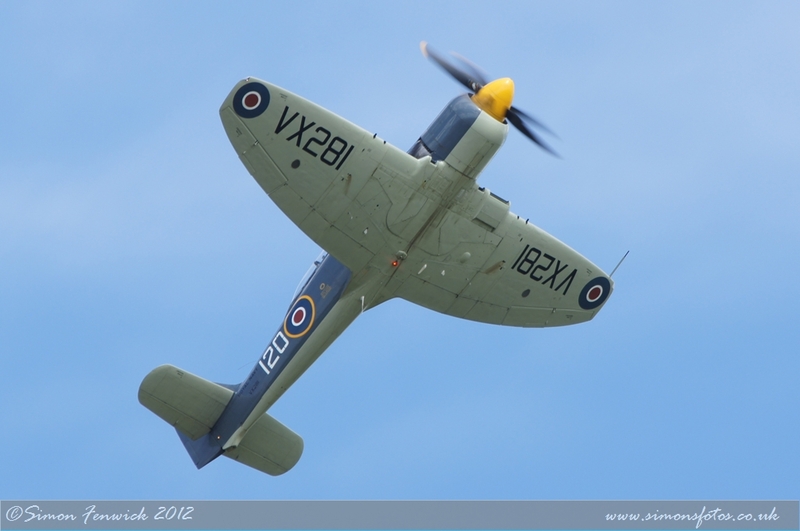 Paul Bonhomme took X4276 back into the air on 9th March 2012 and almost echoing ‘Mutt’ Summers comment after first flying the prototype Spitfire, commented that it is ‘faultless’. 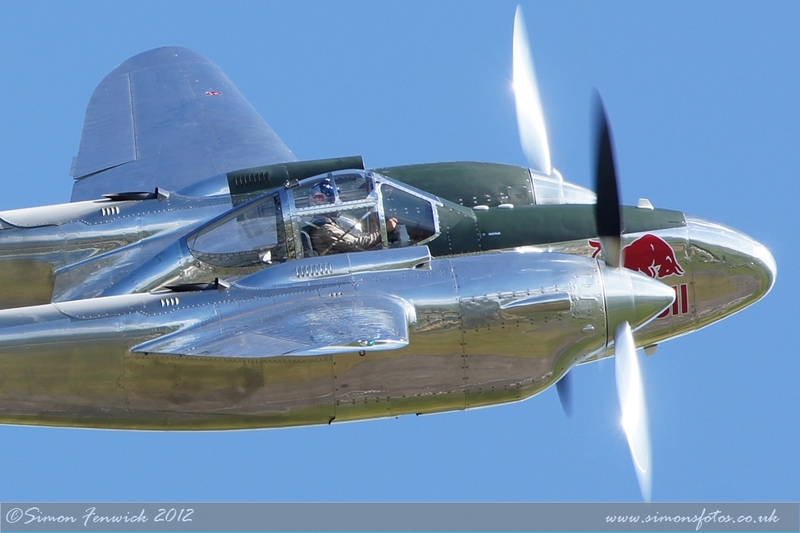 Legends 2011 saw the first appearance in the UK of the Flying Bulls Lockheed P-38L Lightning and drew much praise for its display. 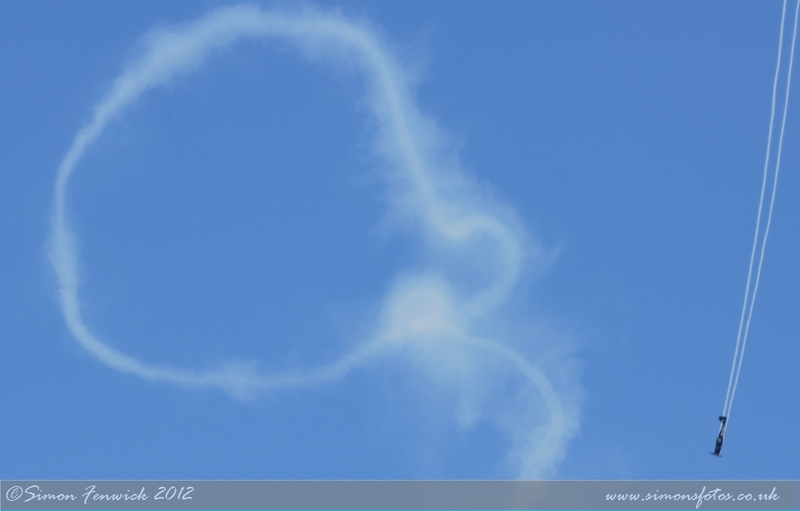 2012 saw its return for a full aerobatic routine. 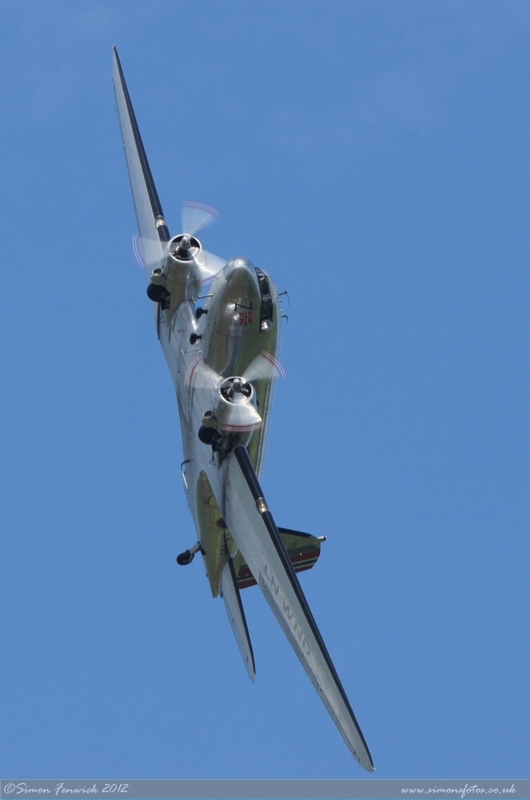 Although the chrome finish is not to everyone’s taste, no one can disagree that it certainly gleamed in the sunny skies this year and the display brought great cheers from the crowd for the fast but graceful routine. 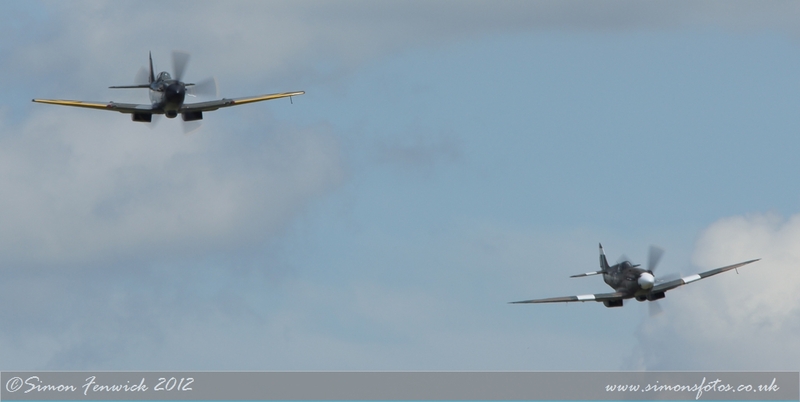 Next to take to the skies were more Spitfires, this time for the traditional Legends tailchase. These comprised the Mk.I P9374, TFC’s Mk.Vb EP120 and Mk.XIVE MV293, Mk.VII MV154 from Max Alpha Aviation in Germany (it’s still strange to see a Spitfire bearing a German civil registration! 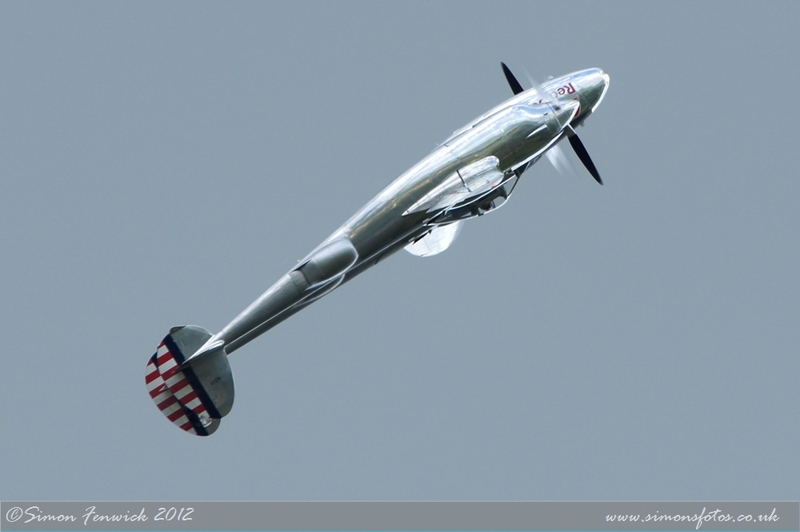 ), Richard Lake’s Mk.XVIE and Christophe Jacquard’s Mk.XIX. With the Mk.XIV and XIX made fast beat-ups of the airfield, the others created a real ballet with a stunning chase sequence. They were followed by a pair of Hispano Buchons, these being the desert painted example now owned by Richard Lake and ARCo’s ‘Yellow 10’ which were eventually chased off by one of the Spitfires. Machines from the United States played a huge part in operations from British shores during WW2 and indeed many were also used by the Royal Air Force and Fleet Air Arm. 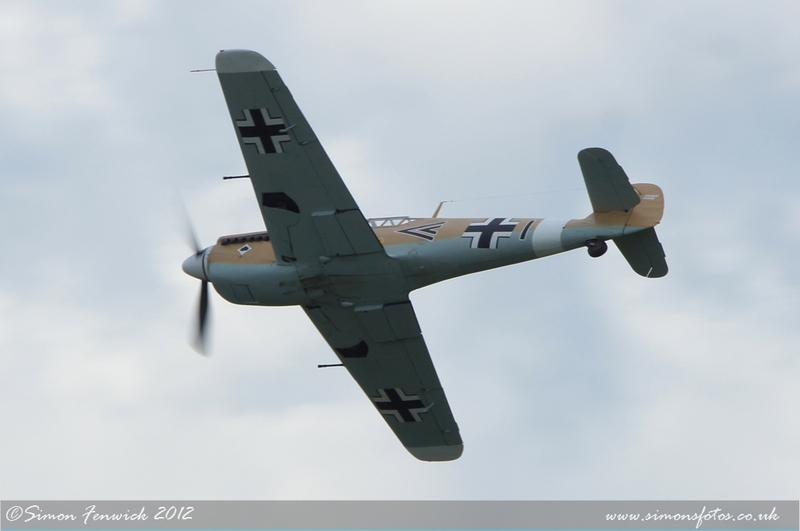 Representing these aircraft, there were several sequences involving several of the types that came ‘over the pond’. 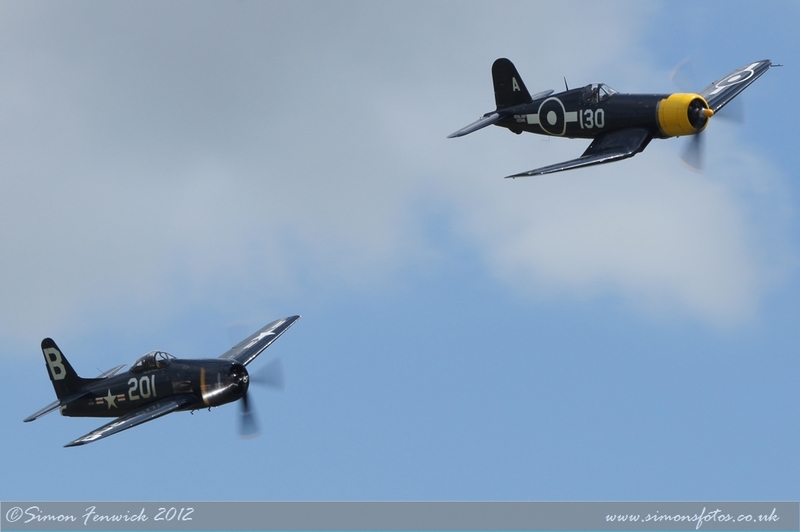 First we saw the TFC pairing of the Grumman Bearcat and Goodyear FG-1D Corsair flying a pairs routine. 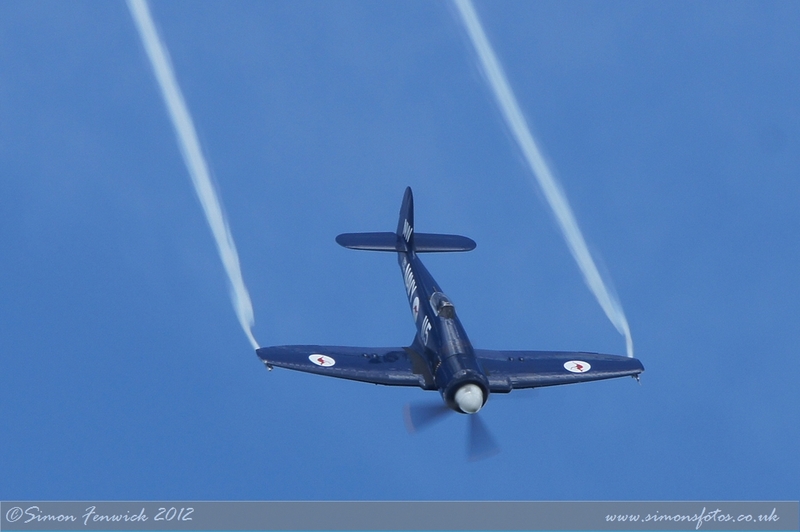 The Bearcat has now been back on the scene for a while, but this was the first display for three years of the unmistakable Corsair with its bent gullwing and it was good to see it back to flying condition. 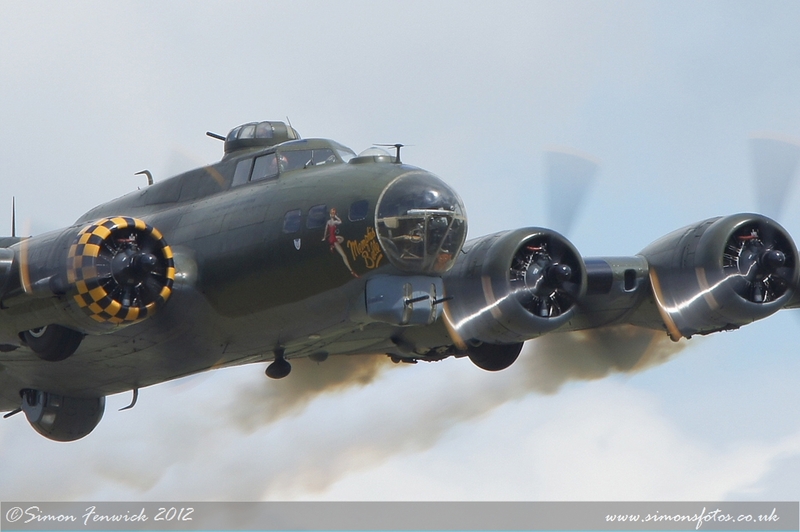 Then there was the perennial favourite Boeing B-17 Flying Fortress ‘Sally B’ and her ‘little friend’. On this occasion ‘Sally B’ was rather overlooked as her friend was show debutant and the new star of the TFC collection, the Curtiss P-47G Thunderbolt ‘SNAFU/War Eagle’. Although seen on the flightline at last year’s Legends, SNAFU still required a lot of work before flight could be considered. 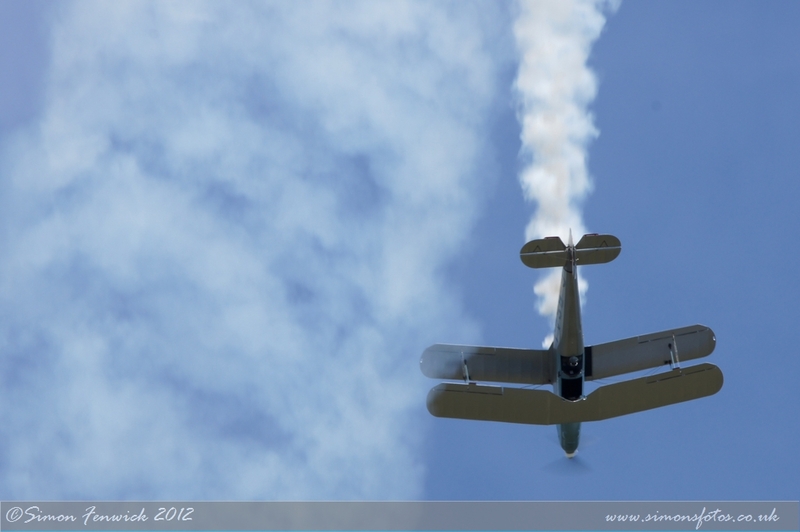 Eventually that first flight, in the hands of TFC Chief Pilot Pete Kynsey, took place on 21st April this year and Legends was the first public flying display for the aircraft in the hands of Stu Goldpsink. 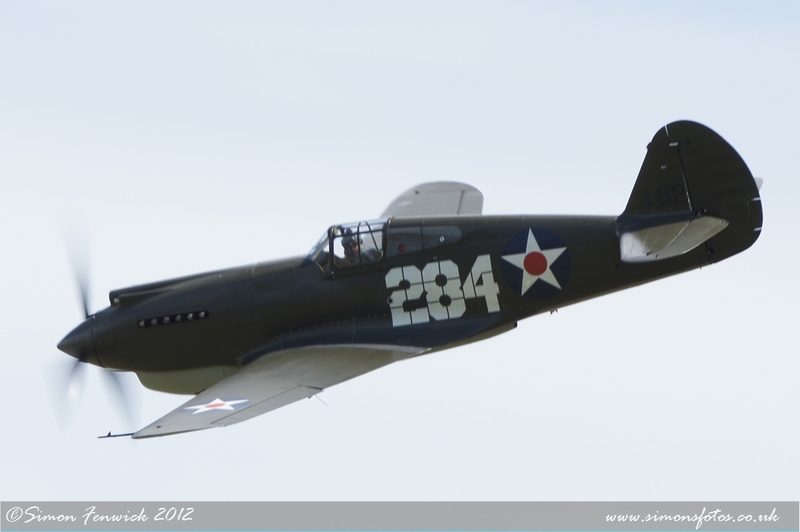 Also from the Curtis stable came another TFC formation with the Hawk 75, P-40B Tomahawk and Merlin-powered P-40F. 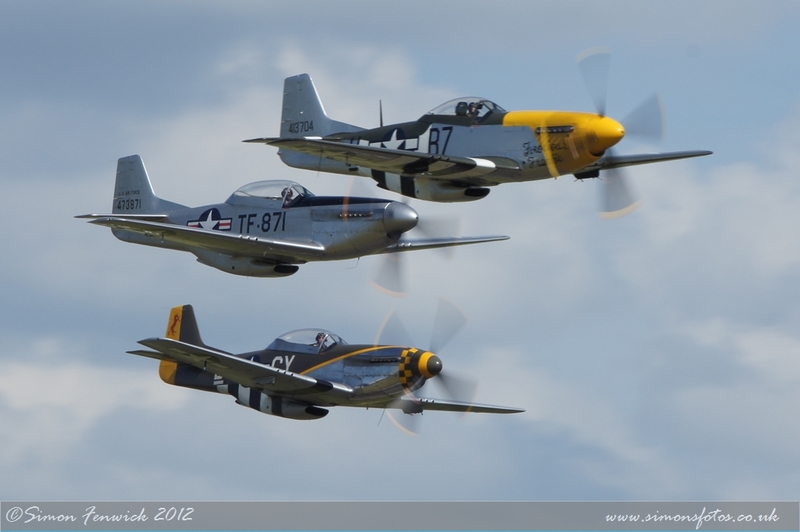 This year, the Mustang tailchase was down to just three aircraft with Duxford based P-51D ‘Ferocious Frankie’ leading the TF-51Ds from Max Alpha Aviation and TFC. 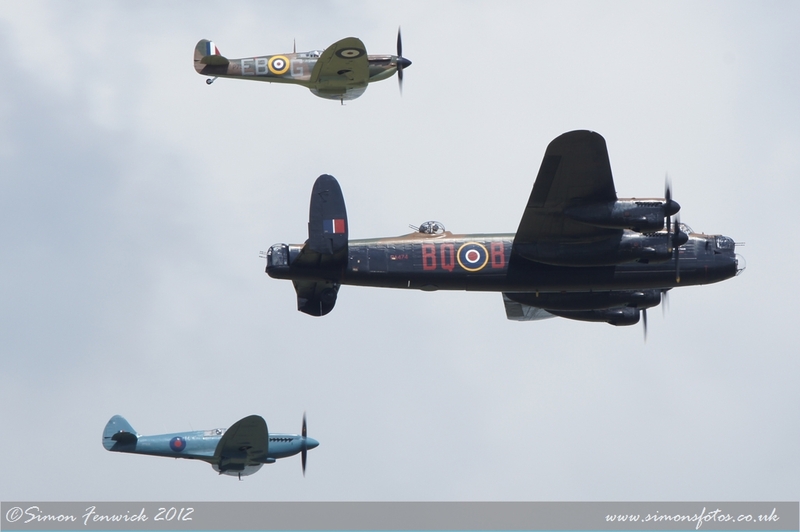 On Saturday the Battle Of Britain Memorial Flight displayed their three-ship formation led by the Lancaster B.1 PA474 with Spitfire Mk.IIa P7350 and PR.XIX PM631 on the wings. 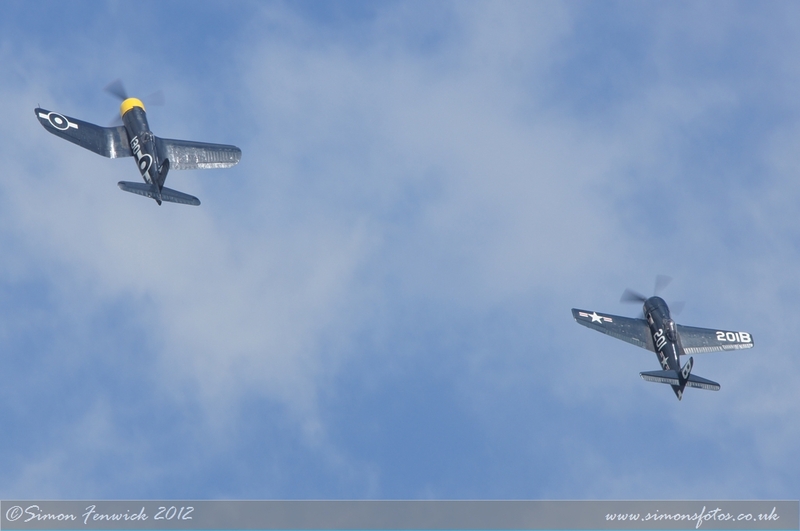 Replacing the BBMF on the Sunday were the Aerostars in their Yaks. 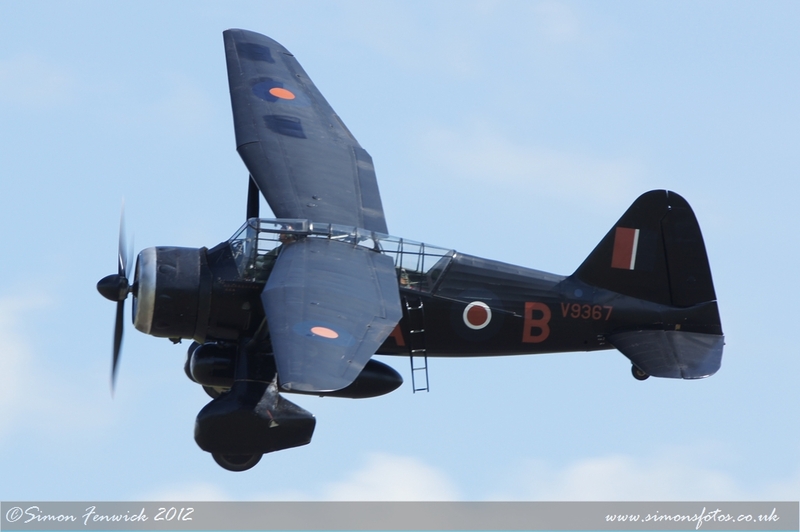 Another wartime RAF type on display was the Westland Lysander Mk.IIa from the nearby Shuttleworth trust at Old Warden. 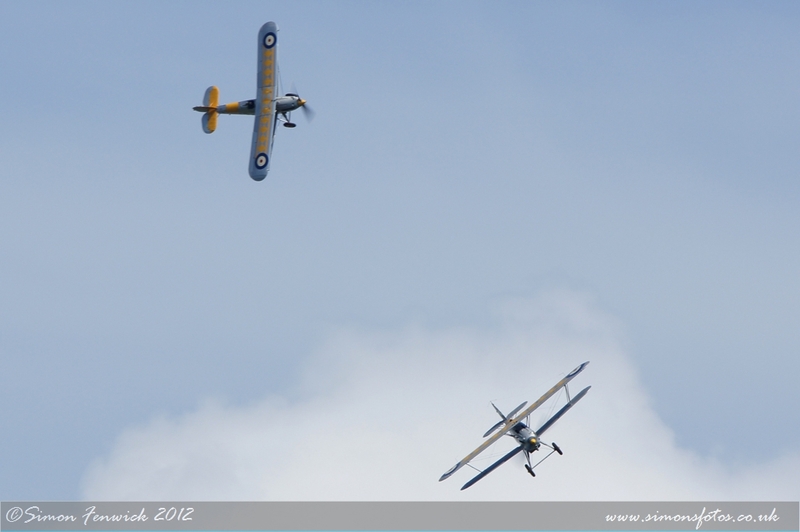 British naval aviation was very well represented and covered the period from the 1930s to the 1950s with a graceful pairs display from the TFC’s Hawker Nimrod Mk.I and Historic Aircraft Collection’s Mk.II. 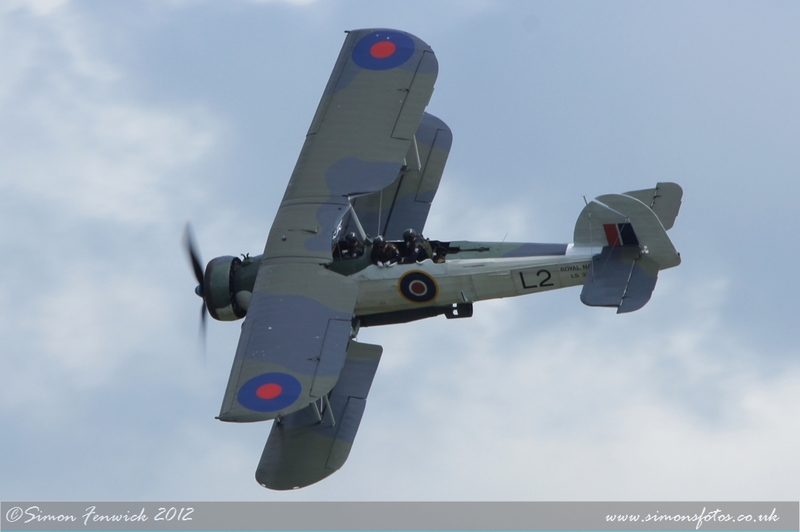 The Royal Navy Historic Flight from Yeovilton in Somerset, brought along their delightful Fairey Swordfish Mk.II (actually a Blackfish as it was built by Blackburn in the northeast of England!) 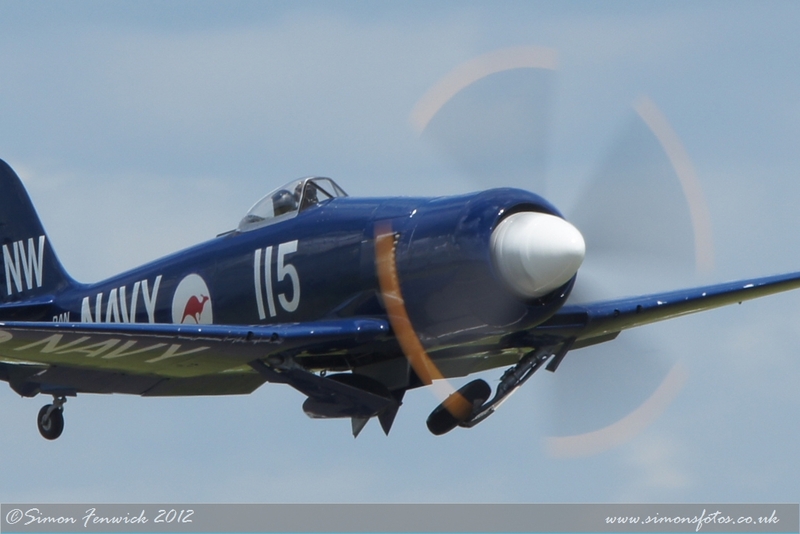 and the Hawker Sea Fury T.20 in the hands of Chris Gotke. An undoubted star of this year’s show was Eric Goujon in Christophe Jacquard’s Sea Fury FB11 in Royal Australian Navy colours. 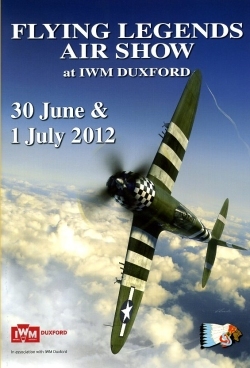 Due to make its debut at the 2011 show, it finally arrived this year and was certainly worth waiting for. Fitted with ‘smokewinders’ under each wing, Eric flies a truly breathtaking display which the smoke enhances beautifully. Indeed at many shows, his ‘partypiece’ is to fly through his own smoke rings – the stiff breeze put paid to this but it still made for some unusual images. 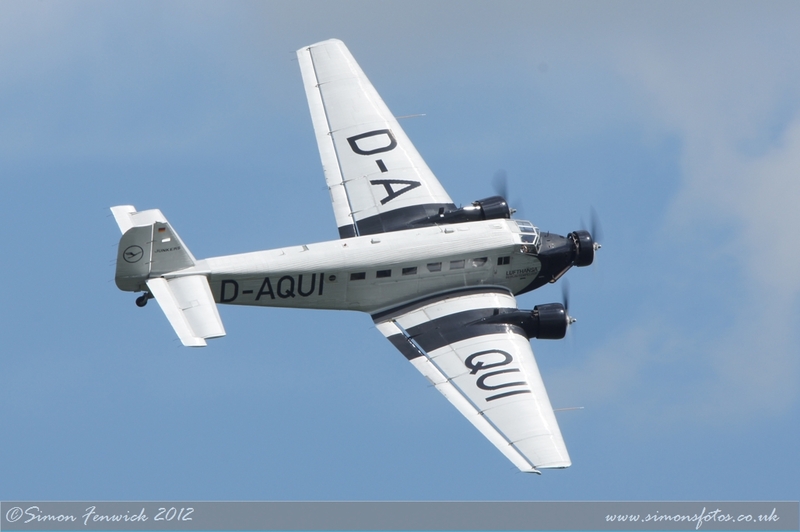 Once again, Lufthansa Traditionsflug brought over their immaculate Junkers Ju52 and it was teamed up with Anna Walker in the Bucker Jungmann and Gordon Brander’s Jungmeister. 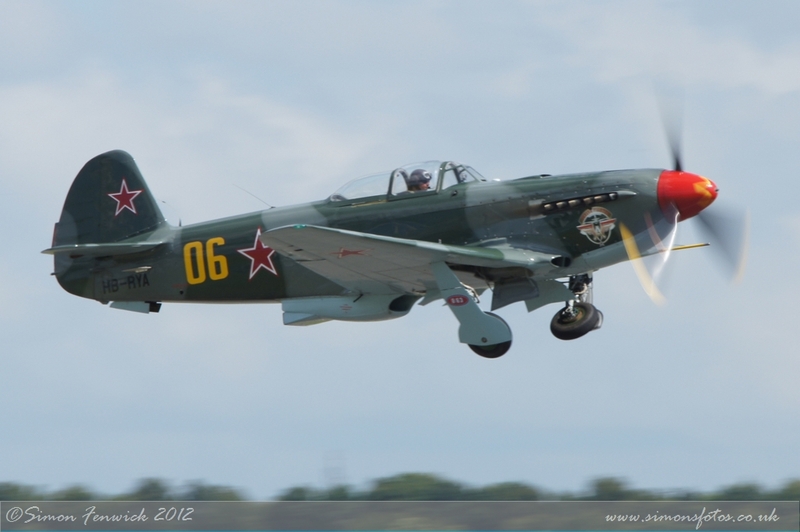 Another pair of returnees were the Yak-3M of Paul Vogelsegang and Paul Boschung’s Yak-9UM. 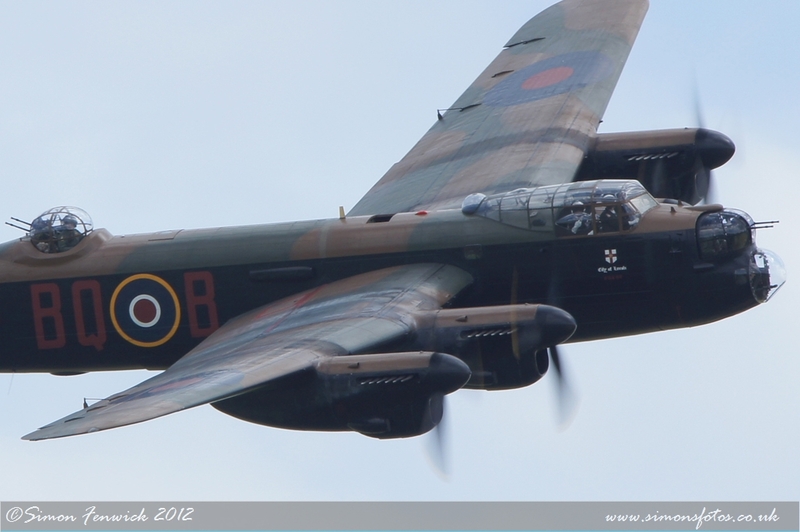 However, this year they were joined by perhaps the most welcome return of all. Following the dramatic events of last year that saw him bailing out of P-51D ‘Big Beautiful Doll’ it was really good to see him back again. 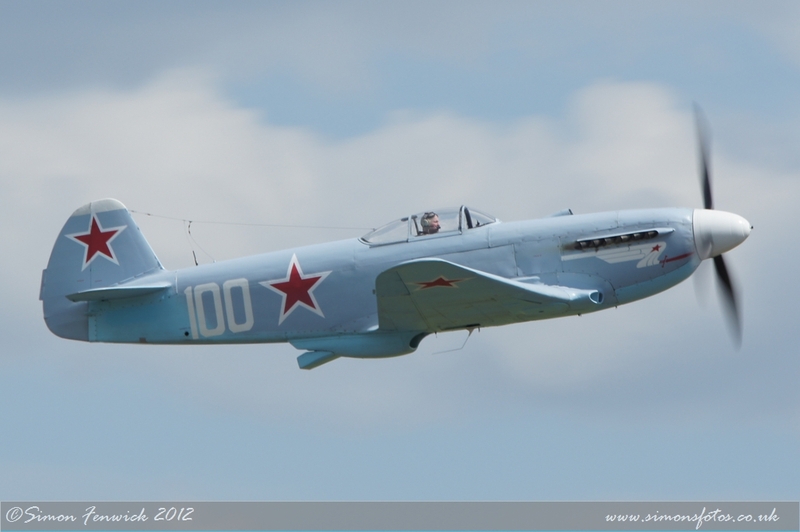 This was the first time that this reviewer had seen his Yak-11 and it is a stunning machine. 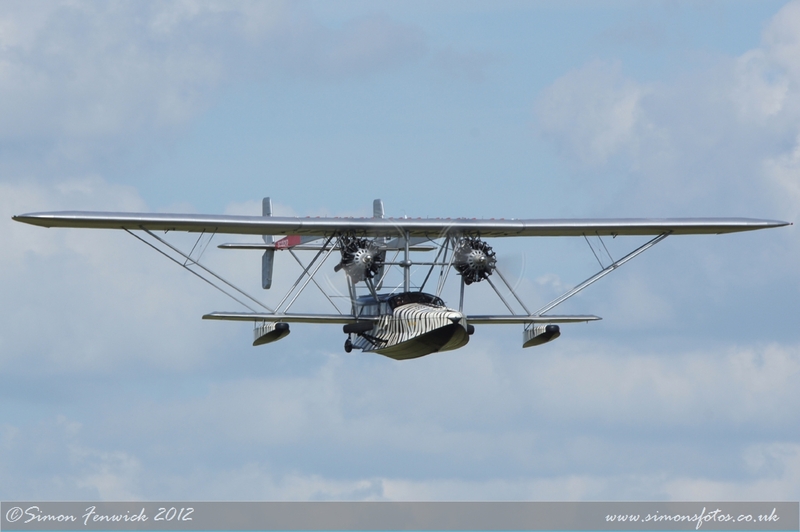 In this seemingly never ending wet summer, flying boats would make a good choice for aviators. 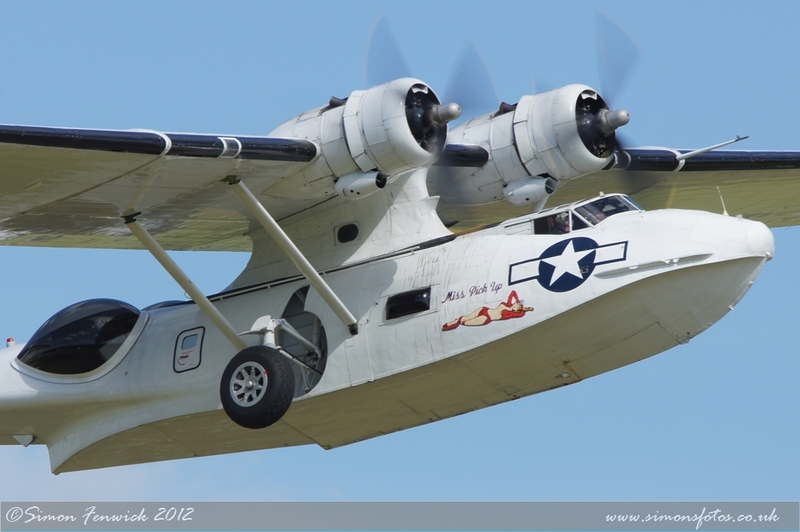 Plane Sailing’s Consolidated Catalina is well known and now sports new nose art portraying ‘Miss Pick Up’ in salute to a famous Catalina of WW2. The other amphibian was another debutant to displays in this country. 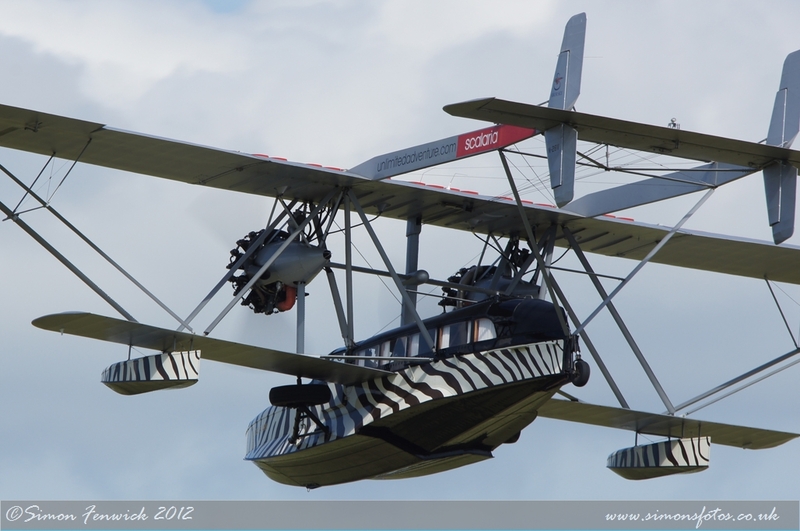 Although it had been seen on the ground at Goodwood two years ago, this was the first time that the public had seen Tom Schrade’s Sikorsky S-38 ‘Osa’s Ark’ recreation in the air. Igor Sikorsky’s S-38 was the first flying boat to be built by the company and was often referred to at the ‘explorer’s air yacht’. 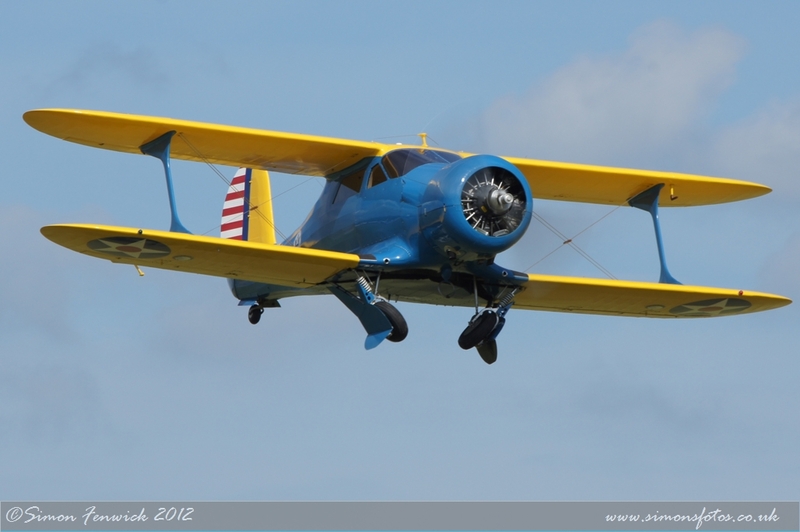 110 were built at Long Island from 1928, they were used by fledgling airlines and explorers alike. Lindbergh used one to survey routes for Pan Am. 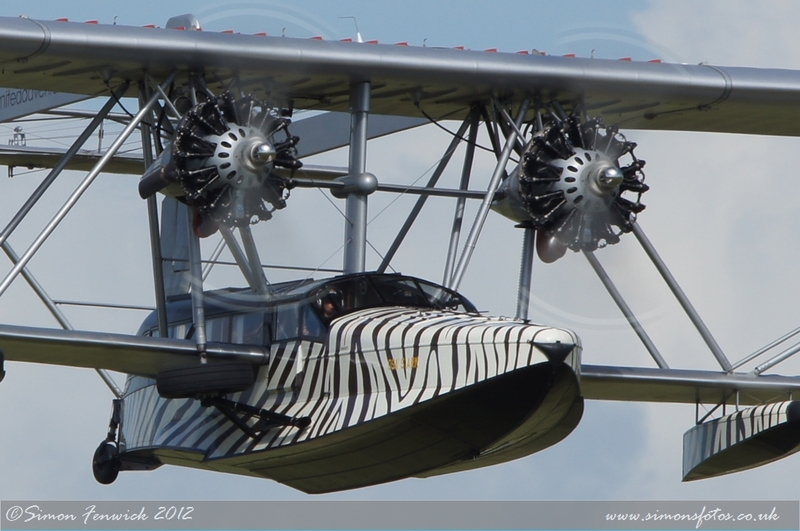 The zebra stripes on Tom Schrade’s aircraft are identical to those that adorned S-38BS NC29V which was owned by Osa and Martin Johnson during their epic African expedition of 1933-34. From their base camp in Kenya they made numerous flights before the aircraft was flown to the UK for shipment back to the USA. 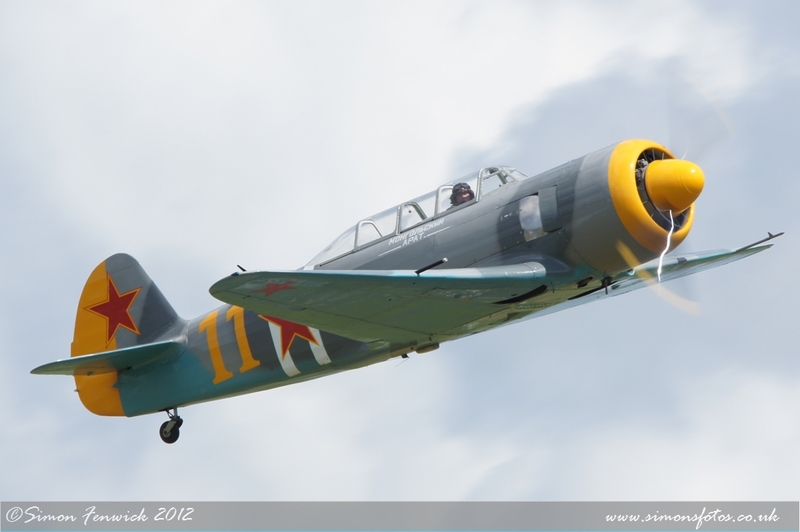 Unfortunately, the original aircraft was written off in a storm in Cuba in 1945. Inspired by the Johnson’s exploits, Tom Schrade commissioned a Minnesota company to build the recreation incorporating an original upper wing and tail booms. After 40,000 hours the aircraft was completed in 2002 allowing Tom to achieve his ambition of flying the world in this unique aircraft. Following the completion of the European section of the tour this autumn, he will be flying to Cape Town, South Africa. 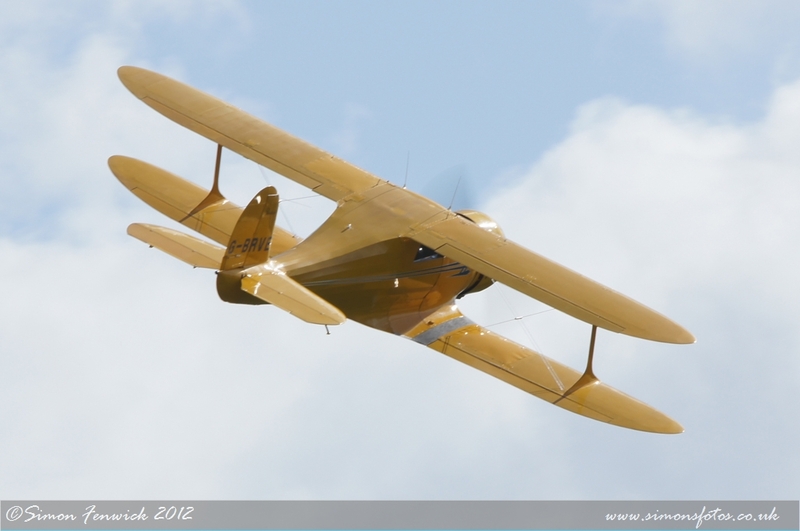 The term ‘Flying Legends’ must also surely refer to what many call ‘The Golden Age Of Flying’. 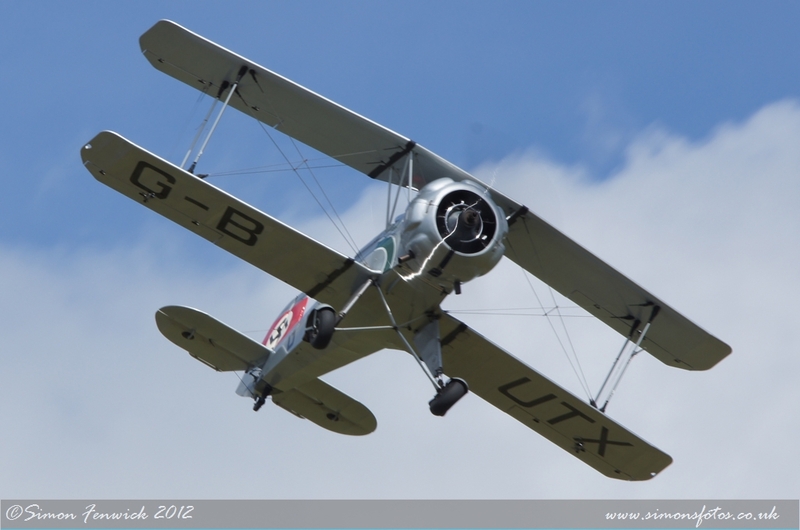 Namely the 1930s and for 2012 there were four classic biplanes on offer. 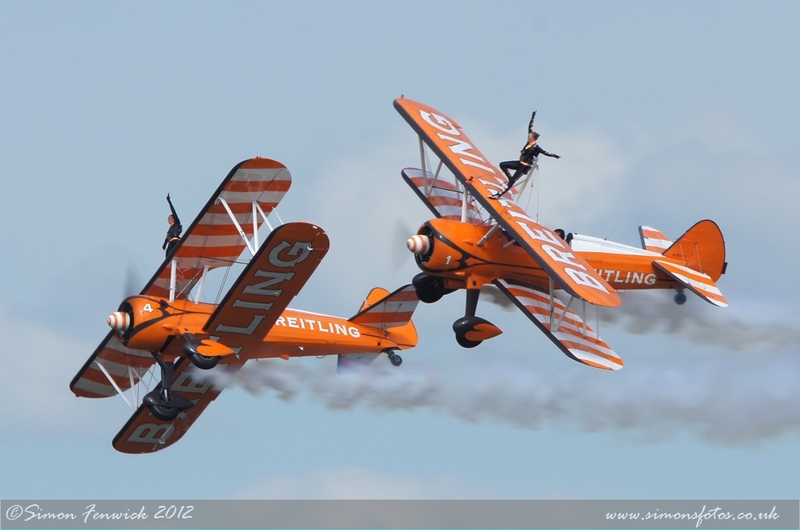 The Breitling Wingwalkers with their Boeing Stearmans have never been busier and now display all over Europe and beyond. 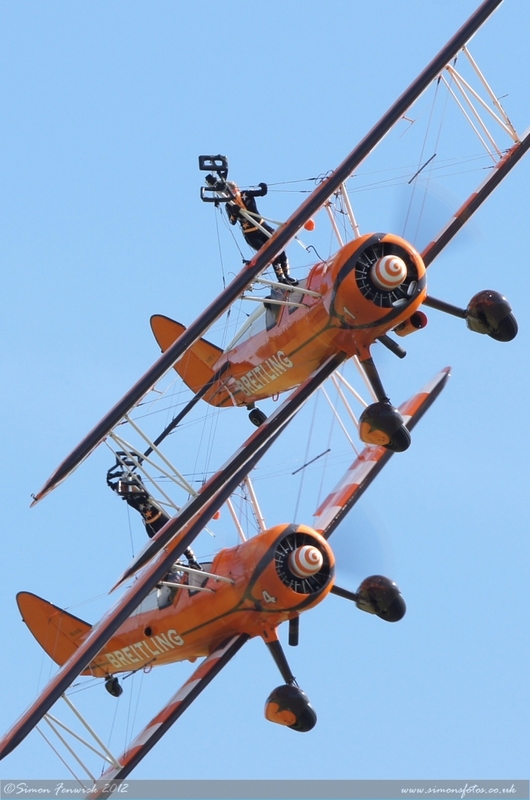 With one pair operating in Europe at the time of Legends, it was down to team founder Vic Norman and Steve Hicks to do the piloting and Stella Guilding and Sarah Tanner to do the wingwalking. The period colour scheme and Breitling logos never look better than when seen against blues skies – yes there were some at Duxford! 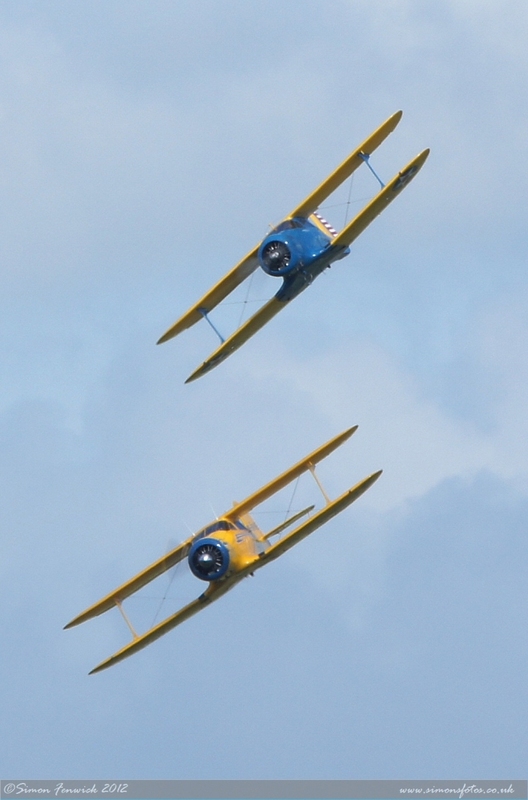 The other pair of 30s aerial carriages were two Beech D-17 Staggerwings. One of these was the locally based yellow version owned by TFC and flown by Anna Walker while the other is owned by Edwin Boschoff and based at La Ferte Alais in France. It is painted in the colours and markings of the US Embassy London. While these two flew the low ‘box’ they were accompanied by what must be the most beautiful Douglas C-47 currently flying. Dakota Norway have been regular visitors to Legends for some years and for this year, in recognition of the close ties between Norway and Britain in WW2, the usual markings had been removed and replaced with RAF squadron codes and roundels. 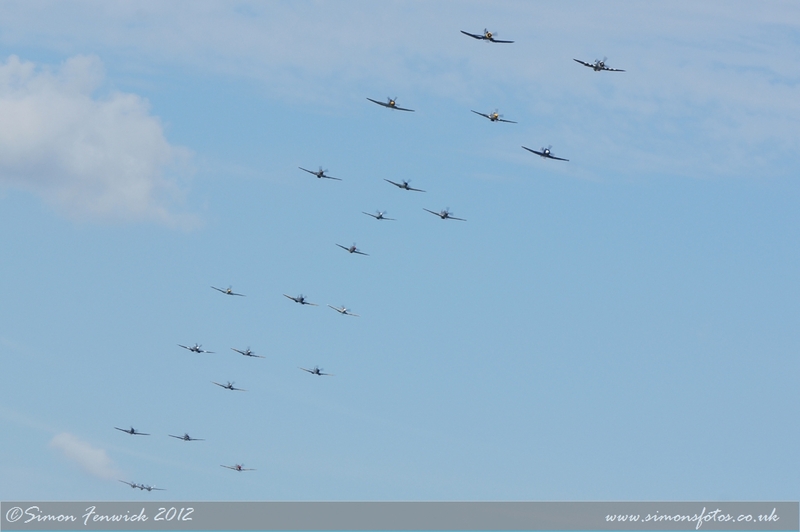 The traditional finale to Flying Legends is the Balbo, a formation comprising as many of the day’s participants as possible – 21 this year. Commencing with a mass take off the aircraft disappear off to the south to form up and to keep the crowd amused, Stephen Grey performs his ‘joker’ routine in the Bearcat. With all taking part in the first pass, the P-38L peeled off and the remainder circled to thunder through once again before the final run and break to land. In the lovely late afternoon light, this was a fitting end to an excellent show. 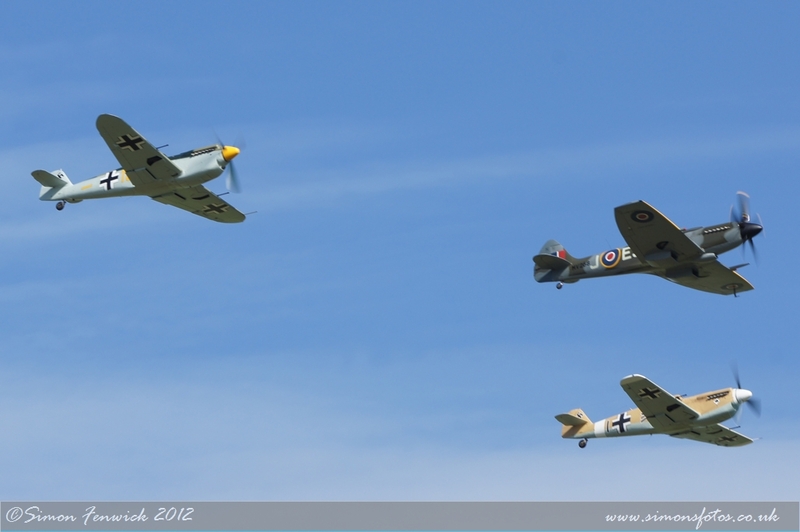 Flying Legends 2012 certainly lived up to expectations with plenty of exciting flying, some real rarities. It did seem as though crowd numbers were down on previous years, this resulting from a number of factors. The clash with the Waddington show can’t have helped which was brought about by Legends having to change from its normal date. This was due to the air space restrictions coming into effect for the London Olympics. Those who didn’t go this year definitely missed a great show.